Charades gets a family friendly, giggle inducing makeover in Sock Puppet Charades. Family game nights are definitely a great way to bring your family together for quality time and loads of competitive fun, regardless of the age of your kids. But after a while, the same old games can start to feel a little…well, played out. Sometimes, finding a new game to enjoy together is part of the fun. With Sock Puppet Charades, you get the familiarity of a classic concept, combined with the creativity and fun of a whole new way to play. 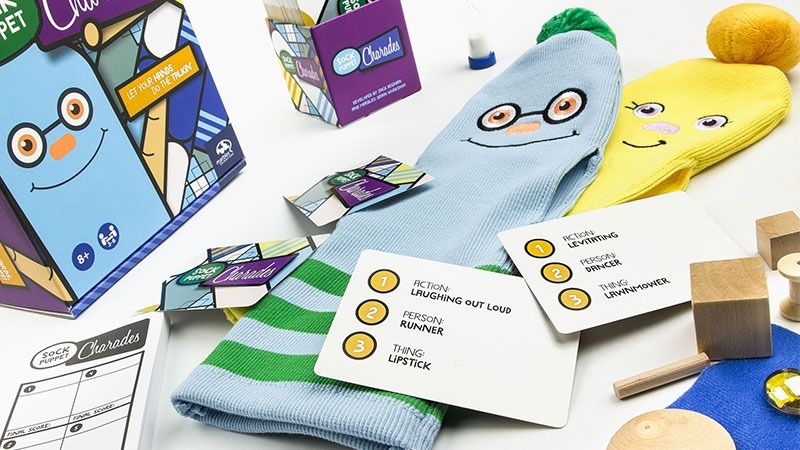 Sock Puppet Charades comes in a compact and colorful sturdy box, which includes everything you’ll need to play the game, over and over again. Like other Charades type games, it includes Charades cards, which each include three different types of cues to act out – action, person, and thing. There are two decks of cards included, which adds up to a total of two hundred cards – that’s plenty of cards to make sure you won’t be repeating a cue any time soon. To play, the actor chooses a card, and then tries to act out the cues so that the other players can guess them. For each correct guess, both that actor and the guesser get one point. A thick pad of score sheets is also included, for keeping track of points. Each turn lasts until either all three cues have been guessed, or the time runs out (an hourglass timer is also included to keep track of time). All of that sounds pretty much like every other Charades game, and rightfully so – this is a form of Charades, and so it keeps the tired and true basics of the game. It is how the “acting” portion is played out that the creativity and giggles come in. In order to act out the cues on your card, you have a number of items at your disposal. The most notable of these are two adorable sock puppets, one in yellow and one in blue. These are very well made, ensuring they will stand up to the test of time (and children). Each sock puppet has an embroidered face and a pom pom on its head, as well as handy slits in the sides that allow you to stick your fingers out as “hands”. You’ll use these puppets to act out the cues on the cards, and it is just as entertaining as can be. Along with the sock puppets, there are a number of props to aide you in your show. These are also well made, and offer a nice variety of uses. There is a yellow pipe cleaner, a small blue cloth, a shiny glass rock, and some sturdy wooden pieces – two block cubes in different sizes, a round disc, a spool, and a short dowel. Armed with these props and your puppets, there’s no cue you can’t act out. The disc and spool can become a table, the blocks can stack together to make a “cake”, the pipe cleaner can be bent into an abstract flower – the only limit is your imagination, and you’re going to need it when it comes to some of the cues you’ll need to act out. There are a few limitations on your acting adventures. You can use one or both puppets, but if you choose to use only one, your free hand cannot be used to act with. It can hold props, but nothing else. You can make noises, hum, etc., but no talking. Other than that, you really have free rein in how you play, and that leads to some really amusing sessions as everyone puts their own spin on the many different cues. At the end of the game, the player with the most points wins, but everyone will be smiling. Sock Puppet Charades is a great game to get your family talking and laughing on family game night. With the familiar Charades concept given a new creative twist, it’s sure to get a smile from family members young and old. Though many of the cues on the cards would be difficult for really young kids to act out, players around age eight and up will definitely enjoy it, and parents will have a blast too.